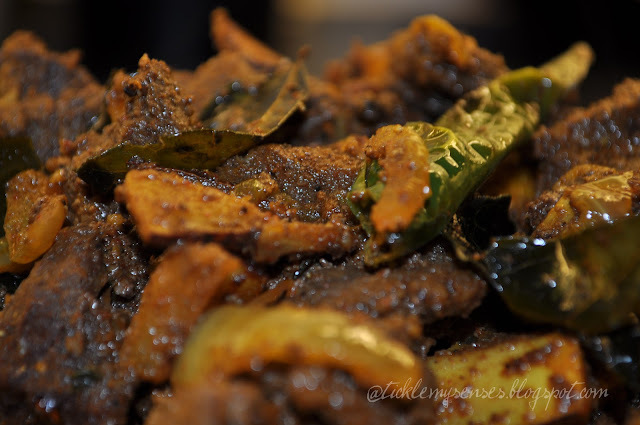 Tickle My Senses: Spicy Beef Chilli Fry. 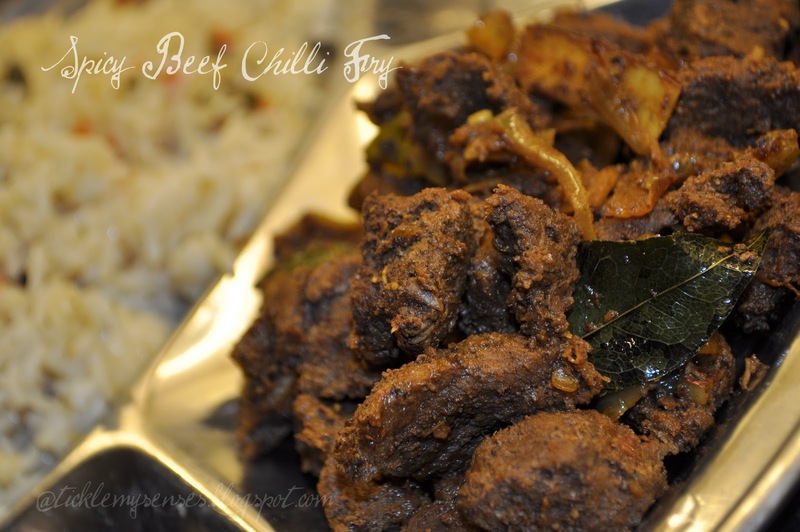 My fondest memory of this flavoursome, spicy, earthy and fiery beef chilli fry was on a house boat cruising along the backwaters of Kerala during our honeymoon 6 years ago. Our chef on board made us a special lunch to accompany this awesome beef chilli fry. I did ask him how it was made and made a note of it on a paper napkin, which I lost somewhere along the way.........however before leaving Kerala hubby bought me an authentic Kerala cook book called "Flavours of Kerala" which I truly enjoy cooking from. I find a lot of similarities between Mangalorean and Kerala dishes, I suppose as both places share the same coastal belt....our love for spices, coconuts, fresh fish and beef go unparalleled........ I have tried most recipes from this book. This one has been adapted from there. Do give it a go......the wholesome flavours will transport you to "God's own country"
1. Make the spice powder-Heat a small pan and add all the ingredients to make the spice powder except the chilli powder. Dry roast it for a couple of mins (3-5 minutes) on a medium flame till fragnant. Place in a coffee grinder, add the kashmiri chilli powder on top of the roasted mixture and coarsely grind to a powder. Keep aside. 2.Clean and slice the beef into medium sized pieces. Marinate the meat with 1.5-2 tbsps of prepared spice powder, keep aside for half an hour. Then add salt to taste, tamarind extract, and sufficient water to cover the meat, pressure cook it for 3-4 whistles or until the beef is tender. Once the meat is cooked, keep the pressure cooker open on a high flame and allow most of the gravy dry up. 3. Heat oil in a heavy bottomed cooking pan and add the turmeric powder and fry for 15 secs, then add the curry leaves and coconut slices. Fry for 3-4 minutes then and add the sliced onions. Saute for 7-8 minutes, then add sliced ginge, garlic and slit green chillies. Fry well until onion and garlic start browning. Add the remaining spice powder (according to your spice levels/ preference) and fry for a minute or two. Add the cooked beef along with any gravy and simmer until it is dry. Check for seasoning, squeeze over half a squeezed fresh lemon and sprinkle over chopped coriander leaves (optional). 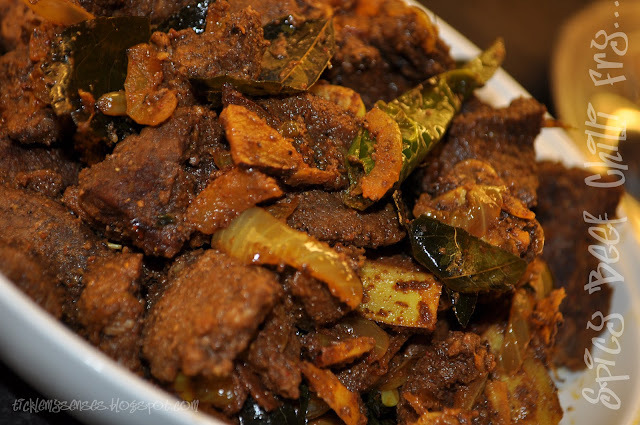 Enjoy as an accompaniment with drinks or along with boiled/ white rice, and daalisosaar/ lentil soup. 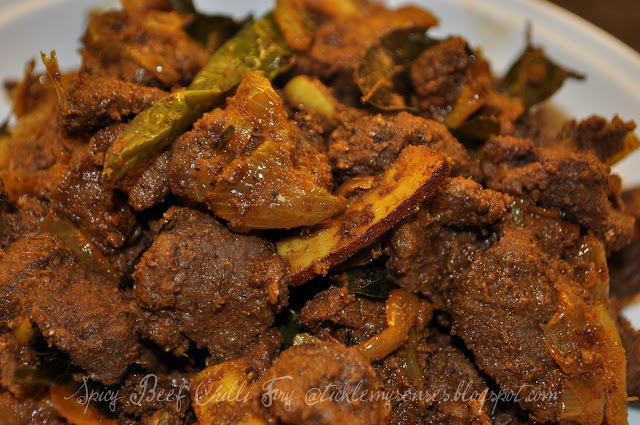 beef fry looks so very yummy...really tempting! This looks a beautiful, fragrant stew...so delish! My favourite food-Beef. I love this cooked in any form. What an exotic dish, solayered with wonder flavors! The dish really looks spicy just as we eat. By Naked urad daal, you mean washed hunh! You need some something sweet after this spicy beef. Come on to my place. Thanks Ramya, Roshu, Lizzy, Aarthi, Acchu's Ammas Kitchen, Meadowly, Anne, Lekshmi and Katherine and Balvinder for your lovely comments. The name itself is making me drool! It'll be great with plain rice!